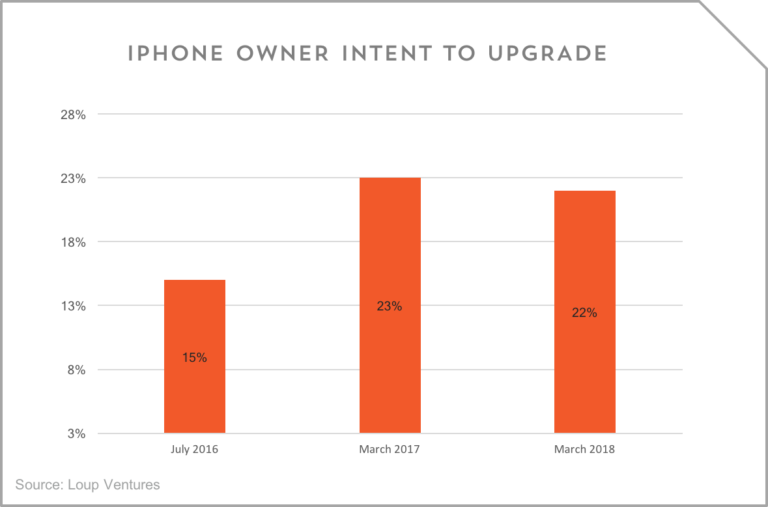 Loup Ventures has released the results of a new survey that gives a peek at how many current iPhone users plan to upgrade to Apple’s new handsets when they’re released later this year. Loup Ventures surveyed a total of 511 people in the United States, 226 of which currently own an iPhone. 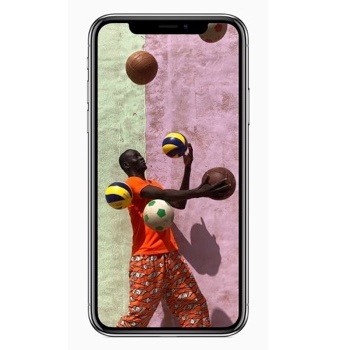 The results show that 22 percent of current iPhone users intend to upgrade their device come this fall when Apple announces new models for its iPhone lineup. Furthermore, 20 percent of those surveyed said they intend to purchase the already-available iPhone X or iPhone 8 over the next year. 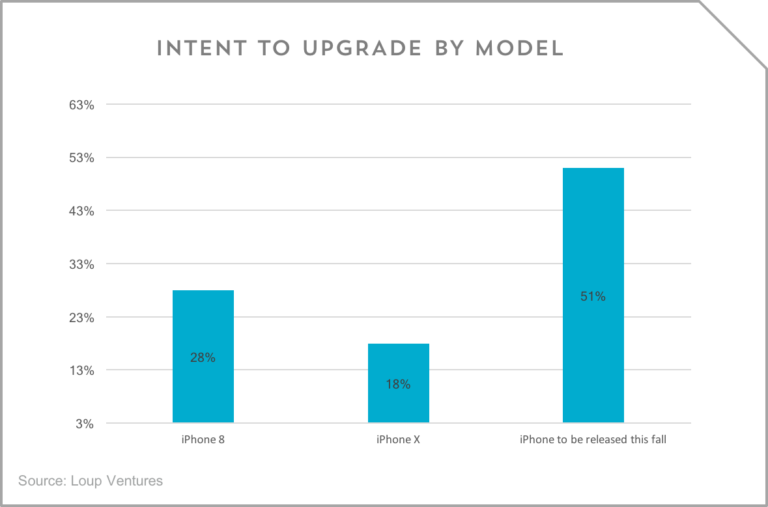 Of the 42% who indicated they would upgrade this year, 28% plan to update to the iPhone 8, 18% plan to opt for the iPhone X, and 51% will hold out for the as yet unannounced and unreleased models. In a similar survey last year, 23% of iPhone owners indicated they would upgrade when the new handset was released in the fall. Two years ago, 15% or iPhone users indicated they would update later that year. Lower growth, more predictable iPhone demand. Looking at the data over the past two years suggests annual iPhone growth will settle into a more predictable 1-5% range. The good news is a more predictable iPhone growth, albeit at a lower rate, should be a positive for AAPL’s multiple. Apple is rumored to be readying three new iPhones this year. Current rumors indicate Apple will release an “iPhone X Plus,” which is said to boast a 6.5-inch display, a more affordable 6.1-inch model with an LCD display, and a refreshed version of the current flagship handset, the iPhone X. Of course, none of this is official, so stay tuned.